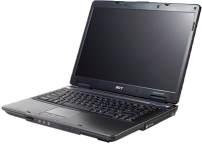 Acer’s Extensa 500 series are a budget-friendly office notebook, suitable for those looking for a reasonable desktop replacement. It can be used to carry out simple everyday tasks such as checking emails and using the Internet. With a modern design, easily adjustable screen and high-quality parts, this series is the perfect choice for a beginner notebook. An upgrade in your notebook's memory will bring a huge improvement.